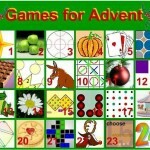 This month we have a link to an Advent Calendar on the NRICH website which gives you a mathematical game when you click on any day in December up to Christmas Eve. Some of the games you can play on the computer but for many of them do not need a computer. Enjoy!